It Girl | EBONY NICHOLS — Aspiring Co. I am actually not sure how Ebony and I found each other, but I am so glad we did! 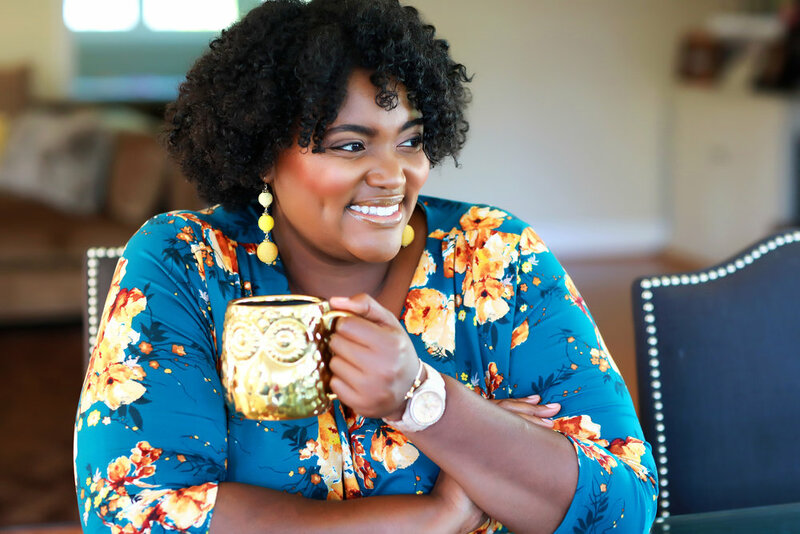 Ebony is the founder of Announce Divinely and one of my favorite accounts to follow on instagram. Her feed is so warm and bright! In August, Ebony was one of the first women to reach out to help us with swag for our one year and she even created a BEAUTIFUL custom blend of confetti that we used for a ton of photos. Ebony is so talented and her passion for making people happy is apparent in all she does! Meet Ebony now! I am a self-taught graphic designer who specializes in all things celebration, and I can be quite serious about celebrating too. When I’m in the Announce Divinely world, I am always pondering and tinkering to create products that encourage women to be intentional about having a good time and celebrating themselves and others. I love everything sparkly, a great cup of coffee, amazing debate, and doing what I can to make the day better for those around me. After I earned my M.A. in Higher Education Administration, I finally came to terms that a career in that field was not fulfilling this intense desire I had to make people smile. I felt like the one-on-one mentorships I had with students were a step in that direction, but I knew that I needed to be in the realm of something I constructed. So for about two years, I dabbled in several creative outlets such as event planning and baking, all the while, keeping a running note on my phone with ideas for greeting cards and planners. Finally, after my best friend yelled, “Just do it, already!” I decided to form Announce Divinely. Creating colorful greeting cards and modern party goods combined two of my greatest desires: to be creative and to make others smile. In a very macro way, Oprah is a huge influence. She has created this space where women feel inspired, yet I can also see how those interactions inspire her. On a personal level, the women in my family have truly shaped me. Their sassiness, creativity, and drive to do things right are echoed through me and evident in all that I create. My very first job was working in my grandparents’ store when I was younger. I worked there for about four summers. Even though it was not what many called a traditional job, it is poignant to me because my grandparents built their business from the ground up. During the summer, I would do my small part to help them maintain their dream. I witnessed entrepreneurship at a very young age, and those early memories still inspire me. One of my proudest achievements has been launching Announce Divinely. This has truly represented my greatest fears and greatest accomplishments rolled into one big ball of confetti. It’s been really inspiring and humbling to see the reaction my journey has had for others as well. When young people share their dreams with me and allow me to share what I’ve learned so far, my heart gets immensely full. I’m also super blessed by platforms like Aspiring Co. that give me the opportunity to illustrate what Announce Divinely is to more people. My initial goal was to create my own space that I could be creative and make a living from it. These goals have definitely evolved! Last year, an amazing mother-to-be was planning her gender reveal and bought confetti from us. She shared that she was so excited about the surprise; no one but she and I knew the gender. Wow! That made me realize how intimate celebrating life’s moments were. From that point, I really became more intentional about the role I feel Announce Divinely plays in my customers’ lives. Every goal since then reflects that acknowledgment. Tenacity! This journey has had plenty of bright moments, but it can be very tough, harsh, and full of unwelcome surprises. Products that I thought would change the world sometimes…well…don’t. Some ideas in my head are horrible when I create the first draft. But I’ve learned that working through the uglies can result in lots of pretties. I’m learning to see the joy in it all. I hope to see Announce Divinely in more stores across the world. I would like to have nurtured a community that embodies the “create more good days” philosophy we have here at Announce Divinely. I also hope to have more opportunities to speak and connect with women about self-care and intentionality across the world. My typical day begins at 7:30am with a strong cup of coffee (just milk, please) and toast with over easy eggs. On my best mornings, I do a quick workout just to get my body moving. After that, I check in with Announce Divinely’s social media accounts, answer emails, and go over my to-do list that I jotted down the night before. Then I tackle the things on that list. I try to wrap up my day around 5:30pm, unless I have a big launch or tons of orders to fulfill. Learning to be patient with myself. There are times when I’ve compared myself to other brands that are at completely different phases in their journey. Rather than be inspired, I would question what I was doing and become quite anxious about the entire decision. I’ve become more comfortable with enjoying where I am and being excited about what’s to come. During some class in high school, I argued with a girl over a seat. I had gotten up; she sat in my desk, and appeared as if she wouldn’t return my seat. Feeling disrespected and embarrassed, I began to argue with her. After the exchange, I got my seat back, but my classmate, who had been my friend since I was about 4 or 5 and watching the entire exchange, said to me, “you look as stupid as she did.” She reminded me that I was focused on the wrong thing. This advice has stuck with me to check myself. Am I getting worked up over the wrong thing? Am I putting too much energy in something with such a low reward that I sacrifice a greater accomplishment? I’ll never forget that. There really isn’t any rhyme or reason to it. That’s why I keep an open note on my phone with all kinds of stuff. I write it down immediately, and develop the idea later. A commonality with my failures has been that I’ve overwhelmed myself or overestimated what I could do with given resources and time. When I was baking, I ran a Mother’s Day special thinking I would get an order of about 25 dozens of cake pops. Instead, I had taken a final order of 112 dozens of cake pops! I worked sooo hard to get those orders completed. And I did. But I did not enjoy anything about the process. I could not intentionally celebrate what should have been an amazing success because I did not plan accordingly. I was so grateful for the orders, but the experience was traumatic. And to this day, I cannot look at a cake pop. I remember driving back from the delivery and screaming in order to keep myself awake (for some reason, I thought I could surprise myself). Failures are really hard for me. So I work hard to give myself grace, work out what I can do to fix it, and move on. Food. I either like to go to new places to eat, cook something different, or watch something about food. Oh! And listen to show tunes. Don’t compare your beginning with someone else’s middle. There are so many amazing brands that can inspire you, but work hard at developing your own voice and brand. No one can do you like you can. We are always evolving. The journey is best explored when we give ourselves permission to try new things. I believe this is where our magic resides. Be intentional about celebrating your awesomeness!